If the number is greater than 0 then the given number is a positive number and if the number is less than 0, given number is negative number. In this article we will show you, How to write Java program to find Positive or Negative Number or zero using If Else Statement, Else If Statement and Ternary Operator with example. First If condition check whether the given number is greater than or equal to 0. If the condition fails then given number will be negative number. If the condition is true then the given number is positive integer. Let us look closer into conditional operator. If the condition (number >= 0) is true then first statement will execute. If it fails then it will check the second condition which is after the : symbol (number < 0). From the above code snippet, you can observe that, this method accepts one arguments of integer type. Within the function we are performing the same operation that we explained in our previous example. In this Java program, we are dividing the code using the Object Oriented Programming. To do this, First we will create a class which holds two methods. First we declared a function positiveOrNegative with zero arguments. Within the function, we used If statement to check whether the given number is greater than or equal to 0 or not. If it is True, we are printing Positive Number statement otherwise, Negative Number statement using System.out.println statement. Next we declared a function positiveOrNegativeAgain with one arguments. Within the function, we performed the same operation that we explained in our first function. 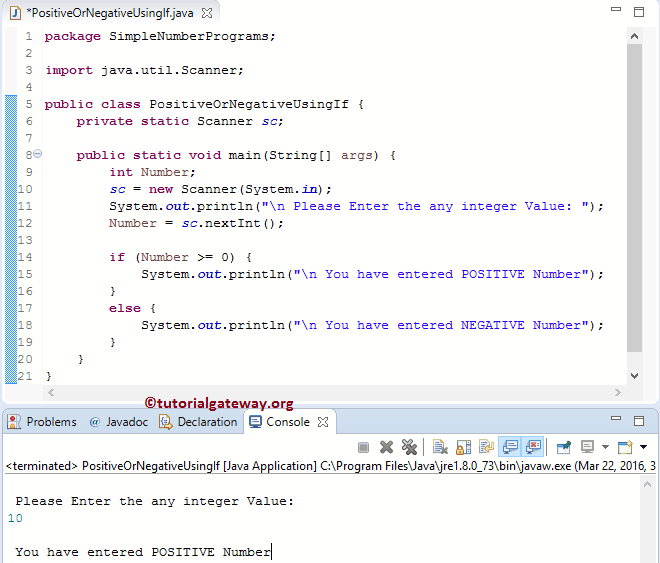 Next, we are assigning the user entered values to the PositiveOrNegative Class variables. Next, we are calling the PositiveOrNegative and PositiveOrNegativeAgain methods.